Joanne Vassallo Jamrosz has over seventeen years experience as a contributing writer with United States Figure Skating. She is the author of numerous articles for Skating Magazine and she works as a contributing writer for U.S.Figure Skating’s web page “Club Spotlight”. She has also been a contributor for the nationally recognized figure skating Ice Network. She also covers numerous skating events for U.S. Figure Skating in the North Atlantic region. Skating with the World is her third book and the latest in the award-winning Skating Forward series. Two of Joanne’s skating books, Still Skating Forward and Skating with the World are children’s book award winners. Both received the Purple Dragonfly Silver Medal in best Young Adult Nonfiction and Sports and both are Reader’s Favorite finalists. Maria of Grande Avenue is her first fiction book. Joanne currently resides in Upstate, New York with her husband, Gregory, and their golden retriever, April. 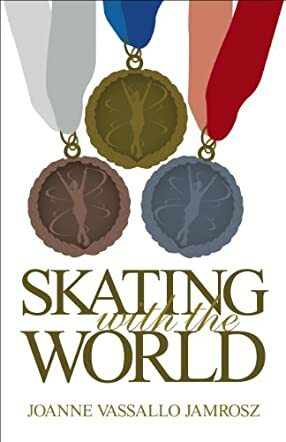 Skating with the World by Joanne Vassallo Jamrosz is an interesting collection of stories of past Olympians in the world of ice skating. The author takes us from contenders and winners in the 1970s through the past Winter Olympics in 2010. We hear about the rigorous training schedules and how fifteen years of training ends up with a single performance by the athletes wanting to be declared the best in the world. Athletes tell about their uniforms and the pride they feel walking into the Olympic stadium to the cheers of their fellow countrymen. We learn about where the international athletes are housed, what they eat, and what they do in their "spare" time. For me, some of the more interesting stories were those of athletes who did not medal. Their primary interest was to do their best and to simply be participants. For them, the experience of Olympic competition seemed itself the goal. I also liked the stories of interacting with other athletes of the world. It seemed to motivate some of the skaters to take up careers helping others to achieve. Many of the former Olympians did begin careers as coaches or choreographers so as to remain in their general area of expertise. As one skater so aptly stated, it is unrealistic to think one can be a competitive skater for all of one's adult career. Even though I would like to have seen some of the athletes reveal their experiences in greater detail, the glimpses of the skaters and their thoughts and motivations might just be an inspiration and motivation to younger contenders.